A pre-Coachella weekend 2 gift from Frank Black and Co. When the Pixies reunited for their first show in more than a decade on April 13, 2004, hardly anyone could’ve known it would start a trend. That we’ve since seen alternative-culture heroes from Pavement to Grandaddy get the band back together in recent years is just a testament to how successful the one-time 120 Minutes darlings’ initial victory lap really was. As the second week of Coachella 2012 approaches, with a weirder kind of post-fame comeback fresh on our minds, the band has shared a free four-track digital EP from its 2004 performance in the Indio, California, desert. Hole-influenced scene-skewerer “U-Mass”! Leftfield hit “Monkey Gone to Heaven”! Doolittle deep cut “Hey”! Loudly off-kilter reincarnation rumination “Caribou”! All before the ’90s-advancing youngsters from Yuck had even formed their teenage band Cajun Dance Party. 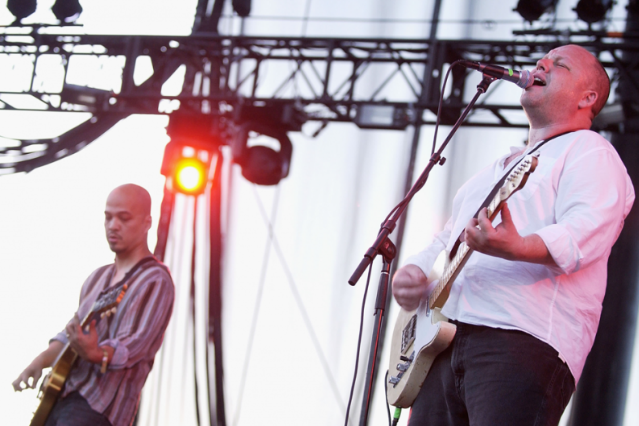 You can also buy the Pixies’ whole Coachella set here.